Citation: C N Trueman "Germany and Rocket Development"
The country most associated with rocket development during World War Two is Nazi Germany. Such was the impact made by German scientists such as von Braun, that their developments spear-headed post-war missile developments both in weapons and in space exploration. The work done at Pennemünde has gone down in history. Germany had started its rocket development plan in the 1930’s. Germany’s first liquid fuel rocket was fired in 1931 – the so-called Huckel-Winkler 1. Both men, Huckel and Winkler, were enthusiasts who probably had no inkling that by 1945, their own countrymen would develop missiles that had the sole purpose of destruction of property and people. When Hitler came to power in January 1933, Germany started its move towards militarism and there were those who could see the military potential of rockets. The enthusiasts who developed for mere reasons of hobby and science were replaced by men who had a more sinister purpose for rockets. The first of the so-called ‘A’ rockets actually flew as early as 1933. The A-2 flew to 6,500 feet in 1934 and by 1937, the A-3, powered by a LOX/ethanol engine, was flying. The next variant in the series (the A-4) has a more familiar title – the V2 as the A series actually developed into the V2. The remote site at Pennemünde housed some of the world’s top rocket scientists. It was a self-contained complex – but was still open to allied bombing during the war. The scientists also faced another major problem. According to Albert Speer in ‘Inside the Third Reich’, Hitler and the likes of Göering showed little interest in rockets as they failed to comprehend the science behind it. Though Hitler was very keen to believe in his own mind about a super-weapon that would change the course of the war, the numerous and understandable failures at Pennemünde during test flights led to less than enthusiastic support from Hitler. Speer claims that the V1 and V2 could well have come into operation two years earlier (1942 instead of1944) if there had been steadfast backing by the Führer. 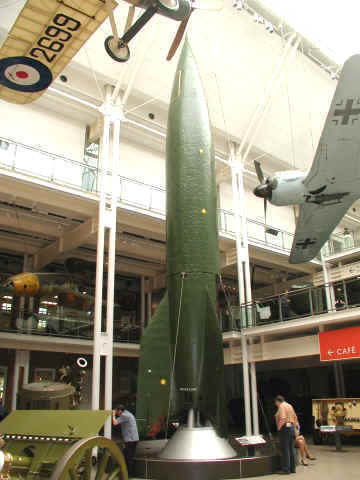 Germany’s first rocket to be used against Britain was the V1 – V for Vergeltungswaffen (revenge or reprisal). The V1 was a winged missile propelled by a petrol-fuel pulse-jet. The V1 was simple to produce and cheap. They could, of course, be caught in flight by British fighter planes (primarily the Spitfire) and anti-aircraft batteries also learned how to track their flight while they were over Britain. Many were either shot down or tipped off target by fighters and it is thought that only 20% of the V1’s ever fired at Britain actually reached their target. However, when they did land they could do extensive damage. Research also indicates that they did a great deal to unease the public in London when the noise of the engine and then its cutting out filled people with dread. The V2, pictured above, was a different proposition. This was a true rocket in the sense that it left the atmosphere, before returning at a speed that made it unstoppable. The terror the V2 brought to London is difficult to imagine in the 21st Century. The V2’s first successful flight was on October 3rd, 1942. The destruction of Pennemünde by the RAF led to V2 production being transferred to Nordhausen in the Harz Mountains. By 1945, 900 missiles a month were being produced. The factory was built into a mountain so it could not be bombed. The first use in anger of the V2 ended in failure. Two were launched at Paris on September 6th, 1944, but they both failed in flight. On September 8th, 1944, that V2 attack on southern England started. About 4,000 were fired on England and but less than 1,500 actually reached their target. It seems that many broke up in flight and that the sheer speed of the rocket was too much for its casing. It is also thought that its guidance system, though advanced for the day, was simply not good enough and many may well have simply hit the sea that surrounds Britain. Though the V1 and V2 are Germany’s most famous missiles, others were produced as the table shows.